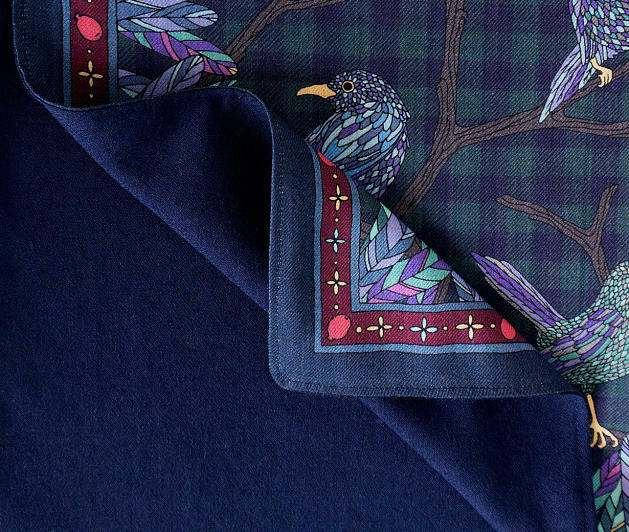 To make our shawls even warmers, we invented the concept of shawl linings and Warm Factor. The Warm Factor for each lining is indicated next to its name with little snowflakes. You can choose your lining based on your region and the temperature where you live, or simply based on its color. 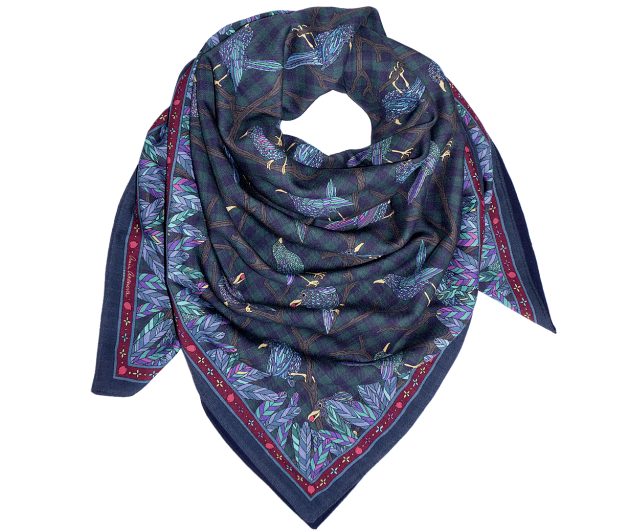 So your shawl can protect you from the cold, no matter what kind of winter your country gets. Plus, it makes it reversible! How Do I Choose My Lining? ...there was a Blackbird. He lived all alone on his boulevard, and was very independent and happy. He liked his little life. Once woke up, he watched Parisians run. Then he was going to visit the nice little baker woman, before returning to pass the time on the terrace of the café across the street – a little before noon, when nobody was around – to chat with his fellow bird from the next boulevard over, before going to strut in front of the kids leaving school, having a bite to eat, going to bed... And doing it all over again the next day. But one day, suddenly, he felt lonely. Maybe because the little baker woman had forgotten him. Or because the terrace was closed. Or maybe because it was Sunday and the Parisians weren’t running. Or because his fellow bird from the next boulevard over had started a nest with someone... Whatever it was, from that moment on, his independence started to weigh on him. He thought about that brunette lady bird he’d met the other day, on his trip to Pigalle. She seemed to really like his plumage. So without further delay, he took all his berries out of their hiding places, and invited her to have breakfast in his tree. The feather and berry frame makes "Breakfast in the Tree" highly decorative. 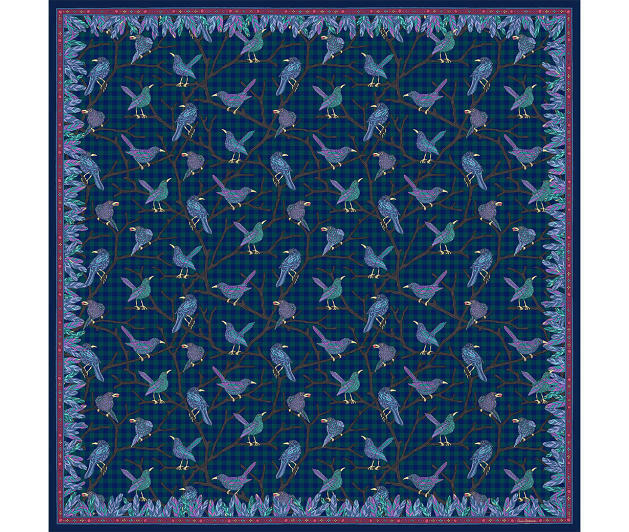 The blackbirds are so numerous that regardless how you fold your shawl, at least one will always be visible. 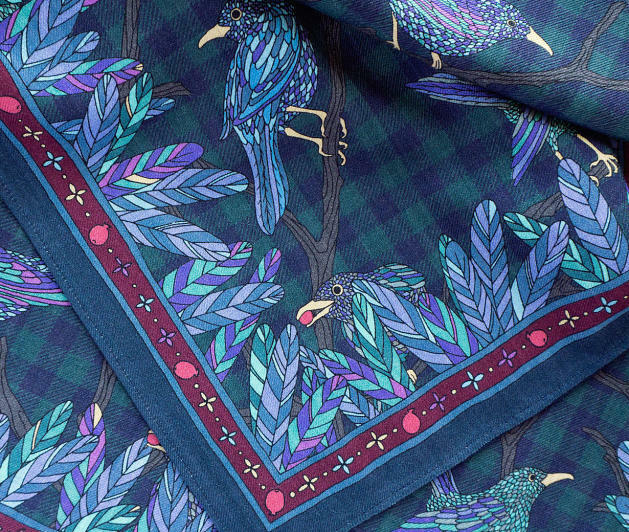 Blackbirds’ feathering and little berries in their beaks are highlighted by dark green and blue tartan background. Our linings are chosen from the best wool we find in Paris, and each has its own qualities. When you make your choice, apart from the Warm Factor, you can also look at the weight of the fabric, which is indicated under its composition. For example, a scarf lined with Wool and Silk Muslin (45 gr/m²) will be more lightweight and flexible than one lined in Wool Flannel (200 gr/m²). It can protect you even if you live in Moscow! Lightweight Wool offers a good balance, making your shawl both warm and flexible. Warm Factor: 1 snowflake is perfect for temperate winters on the French Riviera. 2 or 3 snowflakes are better for Central European winters. Choose 4 snowflakes if you live in the North Pole. In general, these linings are made from soft and cozy Coating Wool. It’s like you were going out draped in your favorite cozy blanket, except you still looking classy and chic. Each shawl with its lining is made-to-order, just for you. Please, don’t wait too long if you fall in love with a color or a texture, our linings are very limited stock. We love fabrics and change them often. 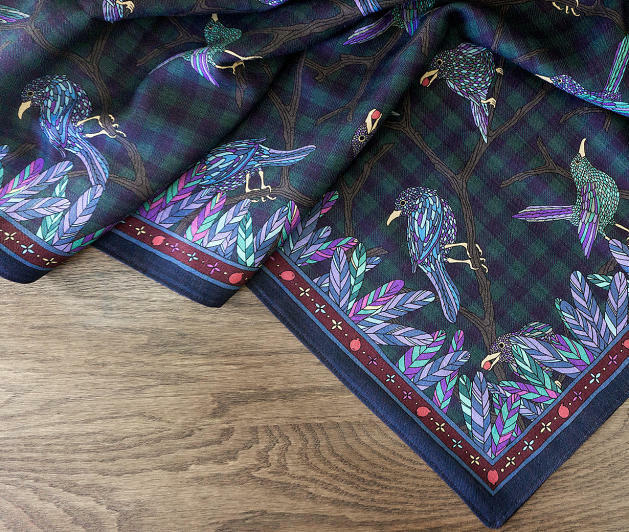 Our shawls are printed in Switzerland with soft and silky Italian wool. We recommend that you handle them with care. This accessory requires high-quality dry-cleaning only. If necessary, you can iron your shawl on the ‘wool’ setting. Please store your shawl untied, and make sure your jewelry or other accessory don’t catch on the threads. Your shawl will be shipped within 3 to 6 working days. This allows us to devote the utmost care to sewing the lining in our studio.